The church is located at the Northwest corner of the triangular village green in Upper Poppleton, where Main Street approaches The Green. Subsidiary greens extend up to the pavement fronting the church site. currently referred to as the church hall. The form of the current church buildings have been in place since the early 20th century. Additional alterations and additions took place in the 1970’s and 1980’s. The most significant changes were; the extension at the front of the church, for additional seating and creation of a new entrance, the joining together of the church and the Sunday school to the rear and new toilets. The church sits within the Upper Poppleton Conservation Area that was designated in 1993, which included The Green and its approached along Hodgson Lane and Main Street. 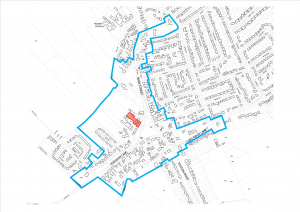 In 2004 the Conservation Area was extended to include the current area, as shown on the map. The area surrounding the church is comprised of residential accommodation, church buildings and local shops. Model Farm adjacent to the Southwest boundary of the church property and Manor Farm on the Southwest corner of the village green are both listed buildings. 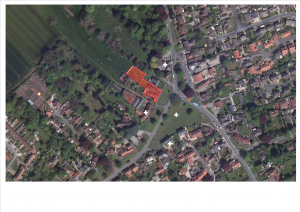 The site is accessible by public transport with a bus stop located a short walking distance from the church. Gothic style chapel built in 1890 from buff brick with stone dressings, includes sloping floor with fixed pews. Chapel extension with three bays built of brick in 1980’s, with an elevated floor level accessed by steps though the door at the side of the extension. The hall built in 1906 with orange/red brick and red brick dressing is accessed at a centre entrance two steps up directly off the pavement. A ramped access located between the chapel and the hall leads to the hall, kitchen, toilets, meeting rooms and chapel. The Southwest wall of the hall is a shared wall with a barn on the adjacent farm. The garden is a secure area accessed through the hall or a gate at the side of the chapel. Access to the garden from The Green is via a path on the adjacent residential property, since the 1980’s extension at the front of the chapel blocks access to the garden. The garden consists of grass, planting beds, a play area and multiple storage sheds to accommodate the storage needs of the church.